It’s no trick – this Halloween party is all treat! Come get ghoulish with us. 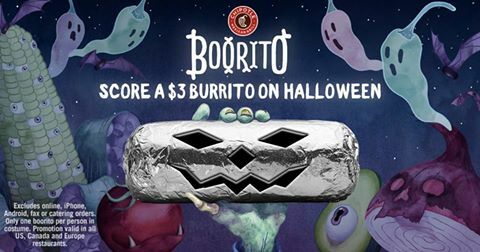 Just go to any Chipotle in costume from 3pm to close, and you’ll get a burrito, bowl, salad or order of tacos for only $3. Scary Pancakes are FREE today! at IHOP® for a FREE Scary Face Pancake. moments over a sweet meal.